What great illustrations are found in this book! They look like early prints that were hand painted. The book would be a nice addition to your Alice in Wonderland collection or to use the pages for your creative endeavors. Very good condition, arrived safely and promptly. 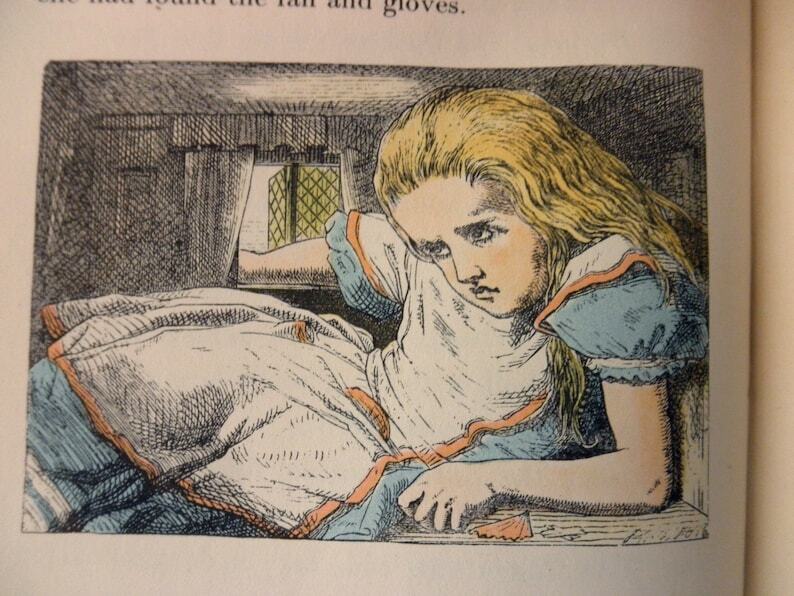 I am happy to have found this special, illustrated copy of "Alice"
Cried when I opened the shipping box. Not only were the books in better shape than my original childhood set that got stolen, but seller added extra goodies. They arrived in the original Book of the Month Club box with the "Welcome Dear Readers" card for joining the club. This set was a special lithograph edition for joining the club that is priceless for that reason alone. Plus one of the books contained a vintage Valentine probably from late 1940s to early 1950s era. Amazing. Thank you! I accept PayPal and direct payment of credit cards through Etsy as well as Etsy gift cards. I'm happy to reserve an item for you for up to 7 days. By state law, AZ residents will be charged 5.6% sales tax on any order. Most of the items I sell are vintage. I do my best to photograph and/or list any areas of concern (dents, scratches, wear, etc.) These items are sold "as is". If you have questions, please convo me before the purchase since items are sold "as is" and are offered without refunds. If/when I make an exception, shipping costs are not refunded. I usually ship within 24 hrs, but within 2 business days. I will ship 1st class or Priority on lighter weight items, but on heavy ones it will be Parcel Select. Books are always media rate. Media and parcel take a little longer, so please convo me if you need a rush order on an item and I can quote a postage price for expedited shipping. Of course, I'm happy to combine shipping on orders to save postage. I'm happy to ship internationally. Just convo me with questions and I can add international postage to most items. Unfortunately, I cannot be held responsible for items lost or damaged in shipping. Insurance is available at an additional cost. Please contact me for a quote.